Text-enable your business phone numbers and open a new communications channel for customers and prospects. Take advantage of the growing popularity of text messaging. 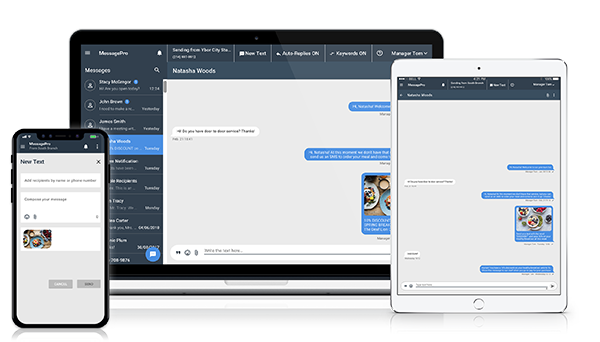 Send and receive SMS/MMS (text, pictures, video, documents) using MessagePro Office from any PC, laptop, tablet, or smart phone! Studies show that 95% of people read text messages within 15 minutes of receipt, making MessagePro a game-changer for any organization. Additional features include logging, reporting, and, automatic replies. Amazingly inexpensive! Click here for Free Trial. We serve residential home owners and multi-family housing. Avoiding missed service appointments is a key part of operations. Texting works so much better than calling, and our dispatch person loves being able to send instant text messages from her PC. Our service techs can even send and receive messages with customers using the main office phone number, or contact other staff members. It’s even useful for business development—we use it in our print ads. It’s indispensable. Want to Know More About MessagePro for Service Companies? Let’s Talk!